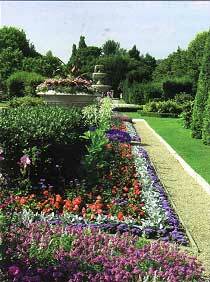 Regent's Park (officially known as The Regent's Park) was once part of the extensive Forest of Middlesex. On the dissolution of the monasteries (1536-40), Henry VIII acquired the Manor of Tyburn and created a hunting ground, Marylebone Park, which covered almost the same area as the 400 acres which comprise The Regent's Park today. The chase remained in royal hands until the end of the Civil War in 1646, when it came under the control of the victorious Commonwealth. Oliver Cromwell sold it off in the form of leases, to pay wages arrears to the New Model Army. Over 16,000 trees were felled during this period. In 1660 Charles II was restored to the throne and the park was returned to the Crown. Charles reportedly executed the chief leaseholder and ignored the claims of the others, before proceeding to sell his off his own leases. In 1668 the land was ‘disparked’ and for the next 100 years the land was used primarily for dairy farming and hay making. In 1760 King George Ill surrendered the revenues from Crown Lands in exchange for the Civil List and in 1794 John Fordyce, the Surveyor General, made a new and accurate survey of the Park. It was identified it as suitable for new development, despite the local heavy clay soil and absence of ground wells for fresh water. In 1806 the architect John Nash (1752-1835) accepted, together with his draughtsman James Morgan, the post of Architect to the Department of Woods and Forests, at the ‘hideous joint salary of 200 pounds a year.’ Following the reversion of the Marylebone Park leases to the Crown, in 1810 the Commissioners of Woods and Forests instructed Nash to develop a new plan for the park. 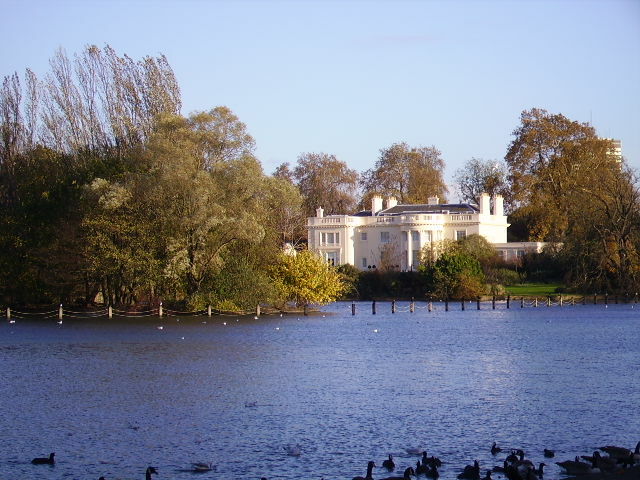 From the outset, it was intended to be an exclusive development, with the land reserved for the ‘wealthy and the good.’ Nash, under the patronage of the Prince Regent, planned a palatial summer residence for the Prince, 50 detached villas in a parkland setting and elegant terraces around the exterior of the park. This was all part of an ambitious plan, to develop The Regent's Park and lay out an elegant new street, Regent's Street, to link it to St James's Park and the Prince's London residence, Carlton House. Work commenced in 1812, but Nash was no businessman and the venture was nowhere near as profitable as he had hoped. The number of grand villas was soon reduced to 26. In fact, only eight were ever built and nothing became of the Prince's summer pavilion. By 1830 most of the outer terraces, named after titles held by the Prince's family, and the lake (from the Tyburn River) had been built to the south, east and west of the park. The north side was originally left open to protect the views of Hampstead and Highgate. The builder James Burton helped with the construction of Regent Street and some of the terraces, and his son, the rising young architect Decimus Burton (1800-1881), designed the nearby domed exhibition hall, the Coliseum in 1823 (demolished in 1875) and worked on Cornwall and Clarence Terraces, facing the park. 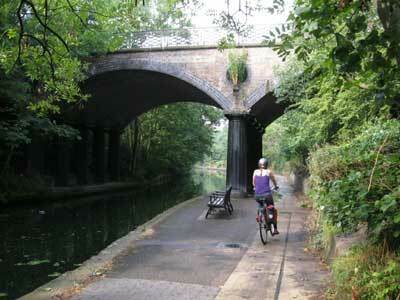 John Nash also had interests in the Regent's Park canal company (he was a shareholder). The canal was constructed in 1816, and runs through the northern end of the park, connecting the Grand Union Canal to the former London Docks. 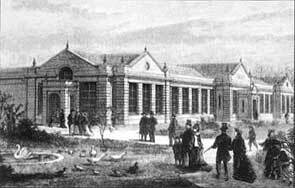 Between 1826 and 1828 the Zoological Society of London established a menagerie in the northern end of the park. The ‘zoo’ was granted a Royal Charter by King George in 1829, but the general public were not admitted for another two decades. Among the zoo's regular visitors was Charles Darwin, a fellow of the Zoological Society from 1831. Darwin was particularly fascinated by the orang-utan, the first ever seen in Europe. In 1847 the Zoo started to admit paying visitors and it remains one of the world's great zoos, at the forefront of research and the preservation of endangered species. During the nineteenth century, pressure from the expansion of London raised concerns in Parliament about the need to provide public open space for recreation, and in 1836 the general public were allowed into sections of the Park for two days of the week. By the 1860s it was attracting thousands of Londoners all year round. Following a run of severe winters in the middle of the nineteenth century, the Book of Days reported in 1869 that: ‘on Sunday the 6th of January 1861, during an uncommonly severe frost, it was calculated that of sliders and skaters, mostly of the humbler grades of the population, there were about 6,000 in St. James's Park, 4,000 on the Round Pond in Kensington Gardens, 25,000 in the Regent's Park and 30,000 on the Serpentine in Hyde Park’. Sadly these events sometimes ended in tragedy, as in January 1867, when over 40 people died in Regent's Park, when the ice broke on the main lake. In 1840 the Royal Botanic Society leased the land within the Ring or Inner Circle, a site formerly known as Jenkins's nursery. Decimus Burton was commissioned to design the layout and buildings, which included a large conservatory, built in 1845. The central part of this was opened to the public in 1846. Other buildings on the RBS site were large palm-houses and a water-lily house. In the summer the RBS held flower shows, fêtes and other entertainments. Nash's original design for the park included The Avenue, a grand carriage drive to provide access to the upmarket villas around the park. After few of these were built, the function of the Avenue changed to a formal Broad Walk lined with eight rows of trees. By the late 1850s many of these trees were looking sickly and the leading garden designer of the day, William Nesfield, was consulted. He initially recommended removal of the stunted trees but then was asked to redesign the whole area. His plans for the Broad Walk (1863) consisted of formal gardens set within the existing tree framework. Completed in 1864 these magnificent High Victorian-style bedding schemes with fountains and ornaments were known as the Avenue Gardens. Nesfield was assisted by his nephew, Markham, who subsequently designed the neighbouring English Gardens (1865-6) with their gentler landforms and extensive shrubberies. The main new garden development in the park in the twentieth century came after the Royal Botanic Society lease expired in 1932. The site was used to create Queen Mary's Gardens. Today this area includes the celebrated Rose Gardens, a cascade and a small Japanese garden, Mediterranean and herbaceous borders, a waterfall, a lake, Begonia Gardens, the Triton Fountain and the Jubilee Gates of 1935. The park's history was not uneventful in the late twentieth century. The Nash terraces were badly bombed during World War II and there was some debate over whether they should be restored. In 1947 the Gorrell Committee recommended restoration and and in 1957 the Crown Estate Commissioners announced that the Nash terraces would be preserved. Restoration work took place throughout the late twentieth century. In 1982 the IRA exploded a bomb at the bandstand in the park, killing seven soldiers. New villas were also added: between 1988 and 2004 the Crown Estate built six new viIlas at the north western edge of the park, designed by the neo-classical architect Quinlan Terry. 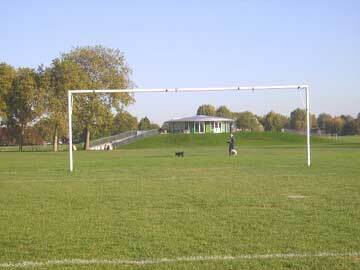 In recent years the park has built up its sports facilities and today it is the largest grass sporting area in London with over 40 pitches for various sports. (These were re-laid between 2002 and 2004) A new glass sports pavilion, The Hub, has recently been built and the park was scheduled to play a significant rôle in the 2012 Summer Olympics in London, hosting the baseball and softball. However those sports have been dropped from Olympic programme from 2012, although the cycling road race will still cut through Regent's Park. In recent months there have been rumours that tented cities will be set up in a number of London parks to act as a temporary home for all the visitors expected in London in Olympics year. Today The Regent's Park staff continue to maintain the high standards of planting and cultivation which have won several Green Flag Awards in recent years. On a hot summer's day in early July 2006, the park was packed with Londoners and visitors, enjoying the weather and the scenery, as they have for nearly two hundred years since it first opened to the public back in 1836. Long may it continue to delight its public! In 1826 Sir Stamford Raffles, the founder of Singapore, set up the Zoological Society of London in Regent's Park and made plans to build the world's first scientific zoo for ‘teaching and elucidating zoology’. Raffles supervised the first plans before being ‘struck down by an apoplexy’ later that same year. The zoo was then established by the third Marquis of Lansdowne, who obtained a lease on a parcel of land at the northern end of the park at a nominal rent, and supervised the building of the first animal houses. Decimus Burton was appointed to work on the gardens and animal houses. At first the zoo's animals, kept continually indoors, died from lack of fresh air and exercise, but, once it was realised they could survive outside, pens were built and many prospered to an old age. The Zoo was an immediate huge attraction with the Victorian public when they were admitted in 1847 and the hippopotamus and its Arabian keepers, and Jumbo the elephant drew very large crowds. Animal rides, on camels and elephants, were also popular. In the twentieth century, Guy the gorilla and Chi-Chi, the giant panda, were among animals that caught the public imagination. The bridge over the Regent's Canal to the north west of the Park was originally called North Gate Bridge but was re named in honour of Lord Macclesfield, the Chairman of the Regent's Canal Company, who steered it through a financial crisis during its construction. In the early hours of October 10, 1874 the barge Tilbury was third in a train of vessels being towed by a steam tug westwards along the Canal. It was laden with sugar, nuts, two or three barrels of petroleum and five tons of gunpowder. The gunpowder caught fire, causing a huge explosion, as the barge went under the Macclesfield bridge. The crew were killed, the bridge destroyed and windows were blown out a mile away. It also destroyed the nearby house of the painter Alma-Tadema, who was fortunately away at the time. The explosion caused such havoc that a detachment of Horse Guards were brought in to help keep order and to ensure safety from wild animals at the Zoo. The bridge was rebuilt in 1876, using the original iron columns.